PRO BOATS IS A MERCURY DEMO PROP DEALER. DEMO PROP PROGRAM IS WILLCALL AT STORE ONLY. NO DEMO RACING PROPELLERS AVAILABLE. Test a new propeller style before buying. See if there’s a better prop style for your boating demands! Demo prop program requires deposit equal to price of propeller. You can test a variety of propellers and sizes; one propeller at a time. Once you have found the correct propeller for your needs, we will provide you with the new propeller. If a demo propeller shows damage, including nicked or grazed blade edges then the standard repair rate will be charged. If you do not purchase a propeller from PRO BOATS, a $60.00 service charge will be accessed and remainder of deposit will be refunded. #1 PERIOD is WOT (engine RPM at wide open throttle) most engines have a 400 to 500RPM window at maximum RPM. Example: Power Band @ WOT = 4500 to 5000RPM; this means, engine requires @ WOT 4500RPM minimum when boat has a full load and a maximum RPM of 5000 with a minimum load ( 1 to 2 people and less than a half tank of fuel). Wide open throttle maximum RPM range must be able to be reached with any propeller used under any application. Get boat up on Plane Time: How fast can the boat get up on plane. This especially important for skiing and wakeboarding. NOTE: Load boat @ 2-persons maximum and ½ tank or less of fuel. On-Plane test: What RPM does engine rev-up to before boat starts moving?On-Plane test: What is time to get boat up on full plane? How many seconds? NOTE: Do two tests of each, one throttling fast from idle to WOT and one rolling on throttle to ¾+ throttle position. Wide Open Throttle test: What RPM does engine have @ WOT? NOTE: Run maximum RPM for at least 10 seconds. Set drive trim, trim tabs for maximum boat lift to give maximum RPM and boat speed. Does prop slip/break loose (RPM goes up fast then stops)? Does prop spin / break loose? 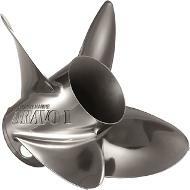 One of the most important aspects of boat performance is the propeller. The Propeller PITCH must be correct for your boat to get up to it’s full potential; no matter what size of engine or kind of boat. Pitch is theoretical distance, in inches a propeller moves forward per one revolution. A 24-inch pitch prop should move forward 24 inches with each 360 degree turn @ 100% efficiency. Slippage is the amount of forward movement lost per revolution. The goal in selecting prop pitch is to be able to run the engine at, or near manufacturer’s recommended maximum RPM when at full throttle with a typical load in the boat, trimmed up for speed. With a pitch too high (over propped) the engine won’t reach maximum RPM, slow to get up on plane and have sluggish performance. With a pitch too low (under propped) the boat will jump up on plane quickly (or worst case, spin the prop and over rev the engine while slowly coming up to plane), accelerates quickly, breaks the prop loose in turns, causing the engine to rev-up and slip the prop and at wide open throttle (WOT), exceed maximum RPM. Neither condition is healthy for the engine, fuel economy and especially performance. At WOT a increase or decrease of each inch of pitch is equal to 150-200 RPM; decrease pitch by one = increase in maximum RPM 150-200. Increase pitch by one = decrease in maximum RPM 150-200. Once a “base line” prop pitch is established for WOT, the next step is to choose a prop that will best handle your boating style and requirements. 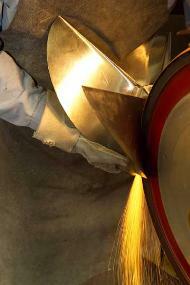 All propellers are trued and balanced prior to being hand polished to a mirror finish. Pricing includes most repairs. If repair requires excessive welding or major reshaping, additional charges may apply. You will be notified prior to repair.